Met with Chris Hanel yesterday and grabbed a bunch of posters for his comedy group’s skewering of the movie, “Speed “. We ate at the new sandwich shop ‘Which Wich’, which for me was the first time. It was a pretty good sandwich and their ‘build-to-spec’ method for assembling your favorite munch-able is rather novel, not to mention pretty tasty. 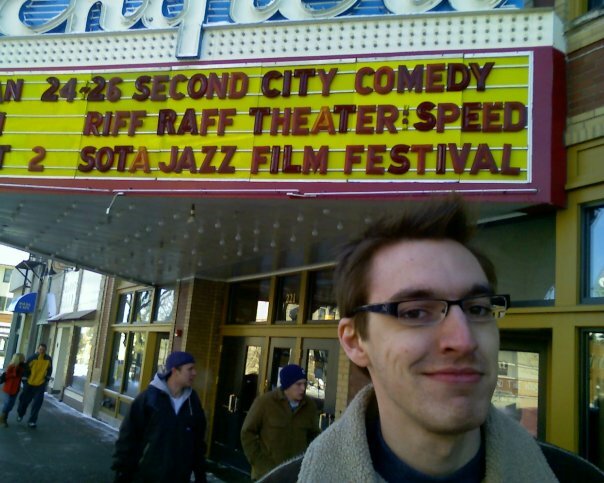 Chris mentioned that he was curious when The Englert Theatre would change their bill-board and add Riff Raff Theater:Speed to the marquee. I informed him that they had made the necessary alterations sometime over the weekend and that we should check it out. Chris was impressed, so I nabbed this picture of him outside the theater.